Stonehenge was attracting sightseers thousands of years ago, archeologists say, after discovering the remains of a Bronze Age boy from the Mediterranean. The teen is believed to have been part of a wealthy group that travelled 2,500 kilometres from southern Europe to Britain. He died, probably from illness, and was buried about a kilometre away while still wearing an expensive amber necklace. The discovery of The Boy with the Amber Necklace suggests the stone circle would have been a place of pilgrimage or sightseeing as long as 4,000 years ago. “They may have come to trade, but visited Stonehenge along the way. It would have been an awesome sight,” said Andrew Fitzpatrick, part of the Wessex Archeology team that made the find. 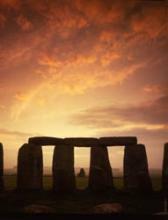 Stonehenge may have been a top international tourist attraction in prehistoric times – just as it is today.